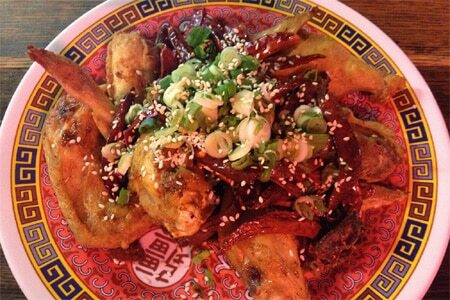 Danny Bowien's NYC branch of Mission Chinese Food 2.0.
: Chef Danny Bowien, who got his start in San Francisco, has invented a cuisine of his own mixing Sichuan flavor combinations and a hipster culinary aesthetic to create a menu that is both fun and addictive. Mission Chinese Food 2.0, in a different location from its original Lower East Side haunt, boasts a somewhat elegant and casual dining room and two bars, one in front and one below. The MCF favorites are here: kung pao pastrami, thrice-cooked bacon, salt cod fried rice --- though portions have been truncated. In addition, there is an underwhelming beef jerky fried rice, a decent Neapolitan pizza (thanks to the pizza oven Bowien inherited at this address), and a tender whole smoked pork jowl. The wine list is short but affordable and signature cocktails include the coconut milk-laced Phil Khallins, served in a bowl.